We define antiques many a time basing on three major aspects; their age, the value we perceive of them and their static nature. The largest number of antiques are lifelessly stuffed somewhere for example in museums (that’s if they once lived); or they were made by acts of man, and have therefore always been lifeless. But this world continues to surprise us day and night. Today in Uganda, travelers can enjoy safaris and tours to an antique which is very old, has profound value, but is not lifeless. This is the life-filled Semuliki National Park. The park is located on the Western and isolated half of the legendary Rwenzori Mountains (or call them the “Mountains of the Moon”) and is an adored jewel with some ecosystems which cannot be found in any other parts of Uganda. This is a place that is unknowingly bypassed by a great number of travelers as they focus their Uganda Safaris and Tours to the other Western National Parks of Uganda. But let’s not blame anyone for not choosing to visit Semuliki; because it is a common practice that treasures are hard to find. Semuliki National Park sits on the Semliki valley floor and the park’s greater area is covered in one of Africa’s oldest forests called Ituri; which was able to fight through thousands of disastrous years during the ice age. As many species, both flora and fauna, were lost in other parts of Africa and the world at large; Semuliki surprisingly continued to resiliently blossom. Her contents are believed to have evolved and accumulated for at least 25,000 years (even older than that), but when you embark on a Tour and Safari to Uganda’s Semuliki National Park, you will not believe the age that this place holds; the park looks so youthful. Being a convergence zone for different climatic and ecological zones, Semuliki National Park has been able to support a wide range of botanical and faunal lives including 53 species of mammals like the massive hippopotami and the smaller forest and large savanna elephants. Uganda Wildlife Authority gives it the tagline “The True Birders’ Haven” perhaps because of its 441 colored species of birds which include the Yellow-throated Nicator and the rare shoebill stork which is not regularly seen in other parts of Uganda. The Semliki River (after which the park was named) is identical to the Congo River which flows to central Africa. Although this river marks the Ugandan territory from that of Congo DR, it does not block wildlife species which are endemic to central Africa from gaining dual citizenship in Uganda. A Safari and Tour to Uganda’s Semuliki National Park rewards visitors with both East African species and Species which are endemic to Central Africa. Tourists do not have to pay for an extra air ticket to experience central Africa because this is represented in Uganda. 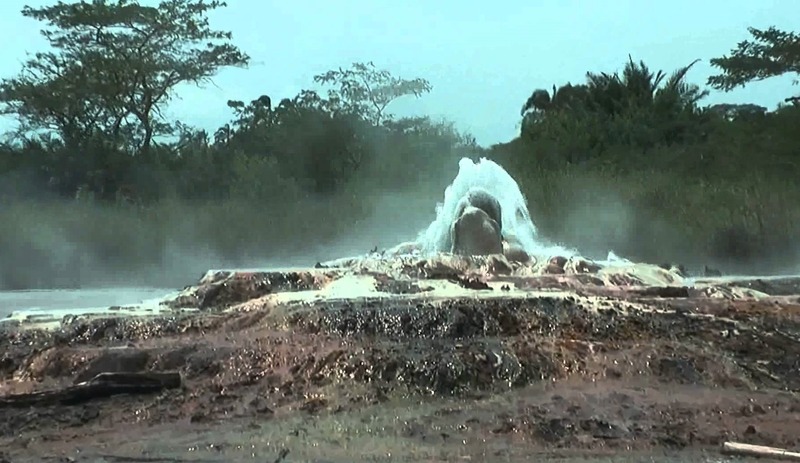 In addition to the rich wildlife, Semuliki National Park also showcases fascinating geographical landforms and features like the “male” and “female” hot springs. Hungry visitors can quickly break their fast by dropping a few eggs in the hot waters and then eating them hardboiled. Semuliki National Park has seen it all and is ready to share with us the treasures which she has forever protected. The choice to claim the treasures is ours.